And now for something completely different: Film noir! At the time of watching this, I hadn’t seen any movies so far in the genre. 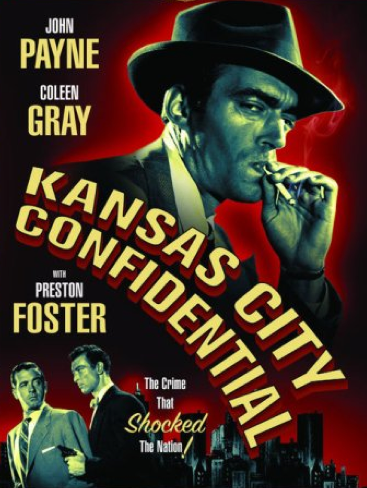 But Kansas City Confidential fell into my lap, so I figured why not start with this one. If you’re going to watch five hundred movies in one year, it’s important to watch ones that are considered classics but which you yourself would have never thought to watch. You have to move beyond movies you’d watch if you were alone. It’s a thrilling proposition. The gist: Three desperate criminals, all facing life in jail or worse, are hired for a job. They don’t know each other, and they don’t know their boss. But that’s just fine. They made the score, and they’re all set for a grand getaway in Mexico. The only loose end in the bunch is Joe, the delivery boy who happened to use an identical delivery van to the one they used as their getaway car. He’s an ex-con too, but he’s actually working to pay his debt to society. That doesn’t stop the police from throwing him in jail, costing his job and reputation. Through connections, he finds one of the three masked men and forces him to let him come along for a cut of the dough. It’s only fair, in his mind. But he’s let with a choice when the third guy’s gunned down by police: Head back to the U.S. and try to find peace, or continue on in the third man’s stead and bring down the whole operation. What I “learned”: It’s so interesting to see how crime is portrayed in movies across generations. Most crime movies I’ve come across that have been made in the last two decades have involved otherwise good people driven to crime. Few exceptions arise—most people who are portrayed doing illegal things are good people driven to do bad things. They’re well-meaning outlaws and antiheroes. They’re justifying it in their heads because they’ve been wronged. Now compare that to Joe, who’s doing bad things purely because he wants to do them. He’s been wronged, sure. But he does bad things purely in pursuit of what he wants. He’s not trying to justify it through victimhood. Let’s bring that back! It’s a fun kind of crime to watch unfold. See this movie if you like: Gangster films that don’t adhere to a mob format. There’s no Mafia or any kind of leading group in this movie. These are solo criminals just trying to keep it cool and not cause trouble on their way to their payday. This movie also shows the more boring sides of crime, too. Not so much fun waiting around for a telegram telling you when to meet your boss. But any Grand Theft Auto fan will tell you that the cool heist only lasts about ten minutes. Being a professional criminal involves much more sitting around than you’d think. Avoid this movie if: Crime movies have to be fast-moving for you to enjoy them. This is incredibly slow by modern crime movie standards, so be prepared. It’s still really well pace, so I wouldn’t completely pass it up.